Maggie Gyllenhaal gives arguably her best performance yet in Sara Colangelo’s (Little Accidents) superb new drama. Winner of the Directing Award at Sundance 2018, it adapts Israeli filmmaker Nadav Lapid’s 2014 film of the same name (and features Lapid himself as executive producer), switching the primary protagonist from a student to a teacher, and from a masculine to a feminine viewpoint. Caring, patient Staten Island kindergarten teacher Lisa Spinelli (Gyllenhaal) spends her days teaching a class of precocious youngsters and her evenings attending poetry classes in Manhattan; while navigating a marriage devoid of chemistry and her own disinterested children at home. When she inadvertently discovers her five-year-old student, Jimmy (Parker Sevak) is a gifted prodigy, she becomes determined to nurture his talent before his dismissive family destroy it – but her desire to do so sets her on a dangerous and desperate path. 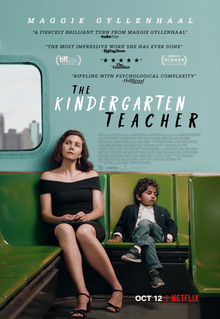 Both a nuanced trip into the psyche of a disillusioned woman and a remarkably tense thriller, The Kindergarten Teacher is a fantastically compelling moral drama; an unpredictable, really daring film that benefits immensely from Gyllenhaal’s intelligent acting and ripples with psychological depth.